In the 1980s, Steve Nelson traversed the Colorado River Delta 25 times by kayak and inflatable, motorized raft. Nelson kayaked the delta again this year, after a human-triggered pulse flow sent high levels of water downriver. Steve Nelson, 62, helped plan the pulse flow that was intended to revive the habitat that had largely disappeared since flooding from the Glen Canyon Dam stopped. Nearly 30 years ago, Steve Nelson started kayaking the Colorado River Delta in search of adventure and a journey through history. He ended up falling in love with the place. From November 1984 until the late 1980s, he learned its every twist and turn, traversing the delta 25 times by kayak and inflatable, motorized raft. A federal recreational planner back then, living in Southern California just west of Yuma, Nelson went from Morelos Dam at the Arizona-Sonora border to the Sonoran village of El Golfo de Santa Clara, near where the river emptied into the Gulf of California. He was drawn there by flooding that temporarily brought the delta back to life, 20 years after the closing of the gates at Glen Canyon Dam hundreds of miles upstream had choked off the water supply. Last monh, Nelson kayaked the delta once more, thanks to a human-triggered “pulse flow” that sent high levels of water downriver. The purpose of the pulse flow, brought about by a U.S.-Mexico agreement, is to bring back the cottonwood-willow tree habitat that had largely disappeared since the onset of drought in 2000 brought a halt to flooding. Nelson, now 62 and retired, was in on the planning of the pulse flow, having become skilled in the ensuing years in the use of satellite imagery illustrating the river’s erratic past. I had been reading about the history of the delta for some time. I wanted to see the places where explorers had encountered Cucapá tribal natives and raging tidal bores, and steamboats had plied their way upriver to Yuma. 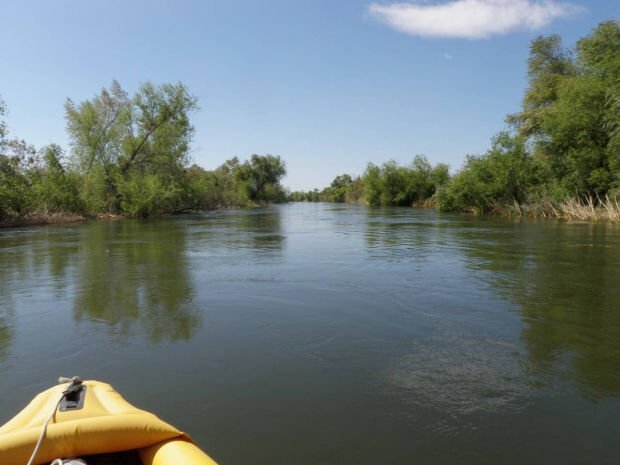 I was just learning to kayak in those days, had been paddling the lower Colorado on the U.S. side, and wanted something a little more challenging. That first visit awakened an interest in something more than history and adventure. I found the river itself to be fascinating. It was a big, wild river, one that hadn’t been there for a few decades, and was now making up for lost time. It was cutting new channels through an almost primordial landscape. I could see that it was changing rapidly. I wanted to go back from time to time, to follow the river’s progress in remaking itself. I had never studied hydrology or fluvial science, but I became an amateur hydrologist on that first paddle to El Golfo. By the time I got there, the river had been flowing a year and a half at a pretty high level. The channel was several hundred feet wide. There had been time for some of the native vegetation to return. There was cattail marsh and there were dead tamarisk trees that had been drowned. The river had a fairly fast current, 4 or 5 miles an hour. It tended to have boils and a few whirlpools when it was going around the bend. Otherwise, it was basically a float. You didn’t have to paddle very much until you got to about where the Rio Hardy drains into the Colorado. At that area, the channel became somewhat indistinct. It was mostly cattail marsh, hard to find your way around, a place where people got lost. The biggest phenomenon on the river was further down, in the intertidal zone, about 21 miles upstream from the mouth of the river, where there was a huge blockage in the channel. The tides at the north end of the gulf are quite extreme and pushed sediments upriver to form a big sandbar — a sediment blockage spanning about 15 to 20 miles. When the water started flowing again in the early 1980s, it dammed up at first behind this blockage, and became a continuous freshwater lake, about 30 miles long by 30 miles wide, and 3 to 6 feet deep. It took three years for the river to cut a new channel that opened a way down to the gulf. It got easier to get through, and it also drained the big lakethat was down there. The only danger for boats back then was in a few places where the river was cutting away at the banks, and occasionally sections of banks would collapse. The main challenge was simply navigational. Most of the time, it was relaxing, at other times, the main issue was just trying to figure out where I was. This time around, it was just wonderful to be back on the river and to follow its natural channel. The first 10 miles south of Morelos, Mexico were very beautiful, with cottonwoods and willows overhanging the channel. When I got to the San Luis Bridge, 22 miles south of the dam, it was a very emotional moment, because that’s the spot that symbolizes for me the river flowing into Mexico. It’s where the river enters Mexico on both sides. It was pretty exciting just to see a big, wide river there. Overall, the river was much narrower this time, probably 50 feet at most. It was also shallower, but the big difference is that back then, the river had been flowing at high levels since July 1983. The river channel was pretty much scoured out. Now, below the first reach of the Colorado about 12 miles below the dam, the water table drops due to agricultural pumping and there you begin to encounter tamarisks growing in the river bed. That’s where it got to be more of a challenge. The only tamarisks I saw in the ’80s were those that fell in the river when banks eroded away. Now, they are attached, are still growing and will survive this short pulse flow. In most parts of the river, live tamarisks are sticking out of the water. You get clumps of them, and they pose a hazard. Below the San Luis Bridge, I started seeing more dead tamarisks tangled in live trees. I had to be more alert. I wouldn’t call it a high state of tension, but I couldn’t relax like I do on a big river when nothing is in front of me but flowing water. I spent a lot of time looking at the vegetation, deciding where there might be an opening and making a quick retreat if I discovered there wasn’t an opening. When the trees die, you get a buildup of dead wood that gets snagged in living tamarisks and forms rafts of driftwood that block part of the channel. 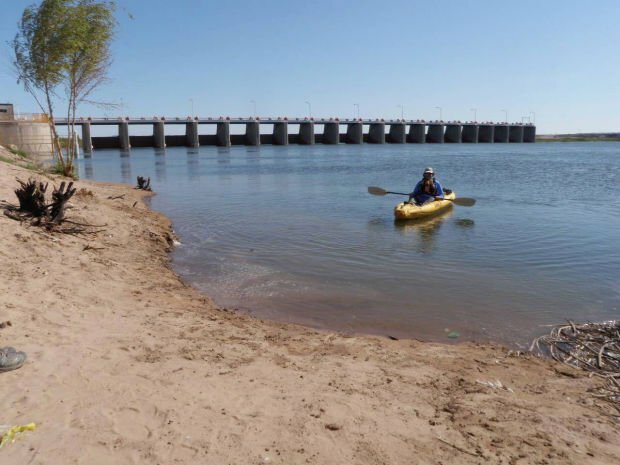 About 31 miles below Morelos Dam I ran into a spot with a massive driftwood snag; it formed a pretty formidable barrier across the whole channel that I couldn’t push my inflatable kayak over. I was running late, had been going up against a strong headwind, 15 miles per hour with gusts to 30, and decided to end the paddle there. But later on, I did another paddle further downstream, into the intertidal zone, beyond where the pulse flow had reached. There’s always water down there — irrigation water that goes into drainage canals and is dumped into the river. And you have treated sewage coming down the Rio Hardy from the Mexicali area, where ﻿a new plant was recently built. The river is once again dammed up behind the tidal sediment barrier separating the river water from the seawater below, and it’s actually an interesting wetlanddown there. I saw marsh wrens building nests, lots of mallards — quite an active bird population. Now, the flows have dropped and I would say that the time has probably passed for someone to paddle even to the San Luis Bridge. But I’m ecstatic that I did this. I never thought I’d have a chance to do this again in my lifetime. I would never have believed that all the different entities that had to agree to do this would ever come to agreement ... but thanks to the efforts of a lot of people, it happened. A diving team is searching the lake. Scientists, environmentalists says the next round of Delta restoration will accomplish more because they learned so much from the first round.